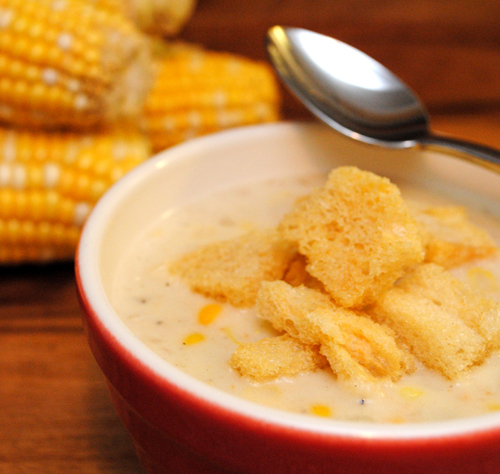 The Glen-Mor Restaurant’s Corn Chowder was made from canned creamed corn, but we brightened-up the recipe using fresh corn cobs. Cut corn kernels off uncooked cobs and set kernels aside, discard cobs. Peel potatoes and cut into large dice. Set potatoes aside in a bowl with water to cover to prevent browning. Finely chop the onion, it should yield approximately 1 cup, and set aside. In a medium stock pot, bring chicken stock to a boil and add potatoes. Boil over medium-heat high for 5 minutes then add corn. Continue boiling vegetables until potatoes are done, approximately 3 to 5 more minutes depending on the size of the potato dice. While potatoes and corn cook, melt salt pork and butter in a separate large stock pot. Add onions and saute until onions are tender, approximately 5 minutes. Add flour to the onions and stir with a whisk, cooking over medium heat until golden brown. Add cooked potatoes, corn, and stock to to onions and roux, stir with a whisk, and cook over medium heat until stock is thickened. Add milk, half & half, sugar, pepper, and salt. Taste and adjust seasonings as needed, amounts may vary depending on the stock used. Once soup is thoroughly heated, serve warm with Croutons.